The wine opens with dark, briary aromas of black currants and mulberries laced with aniseed and hints of violet. The palate is well proportioned with plush, juicy flavors. 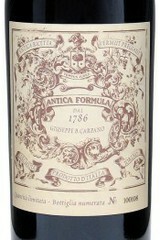 Dense, chocolaty tannins provide the framework for a persistent finish. Food pairing: A true Napa Valley Cabernet, this wine is a great match with grilled lamb chops, a tri-tip steak rubbed with rosemary and freshly ground pepper or venison served with pan sauce.